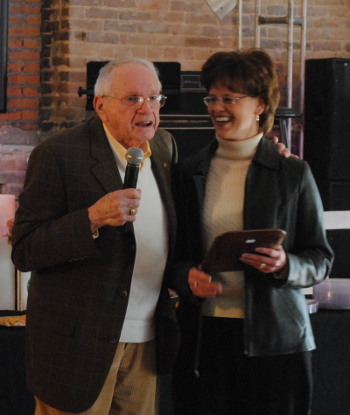 Sherry Hill, the first president of Rockwood 2000, was honored at a reception January 14, 2012. Charter board member, Eddie Bilbrey, told how a few Rockwoodians gathered at Junior’s restaurant to discuss ways to improve the appearance of downtown Rockwood, preserve the past, foster eduction, and instill civic pride. The result was a cultural organization they named Rockwood 2000, and Sherry Hill was unanimously voted as President. Sherry’s strong vision of how to attain the goals of Rockwood 2000 as described in the organization’s charter lives on as work toward beautification, historic preservation, and education continues. While she is no longer an active member, her advice and council is often sought by those who attempt to follow her example of commitment and service to our community. Maurice Grief presented her with a plaque and unveiled a paver in her honor. Mayor Watts presented her with a key to the city. The Rockwood 2000 City Picnic was first held in 2000. 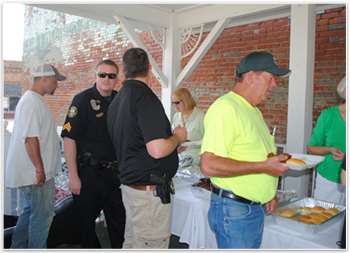 It is our annual celebration and “Thank You” to all Rockwood city employees and is held each June. All City employees, including police, firemen, the Parks and Recreation Department, REU, Library, and City Hall workers, are invited to join us for lunch in Homecoming Park. · Candidate Forum set for May 17th at 6:00 P.M.